Yamaha AVENTAGE RX-A3080 9.2-ch (11.2-ch. Processing) 4K Ultra HD AV Receiver with HDR, Dolby Vision, Dolby Atmos, Wi-Fi, Phono, YPAO and MusicCast. Works with Alexa. Sound quality finessed. The Total Purity Concept, which has been cultivating in-house for many years, encompasses high drive amp technology, high purity preamplification, anti-vibration technology and independent pure power supplies. All models have fully discrete power amplifiers that help minimize distortion. They also adopt pure independent power supplies, allowing dedicated power supplies for the analog and digital circuitry to prevent digital noise from affecting analog circuitry. The anti-vibration heat sinks are designed to suppress vibration from transistors and sound pressure. Independent power supplies for the DACs are designed to further eliminate noise on certain models. 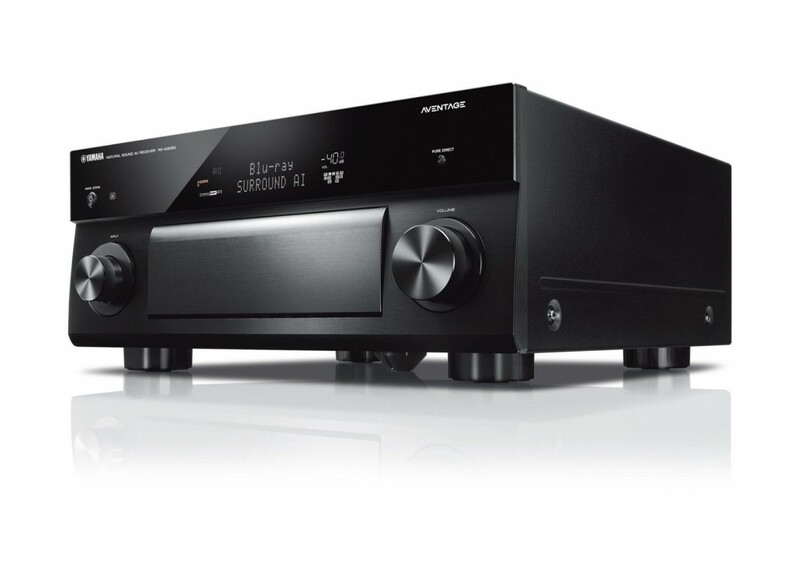 Down to every detail, these AV receivers are designed with full emphasis on the highest possible sound quality. The whole is greater than the sum. Every single part in an AV receiver affects the sound quality. For AVENTAGE models, extra time is taken to find (or develop) the exact parts needed to achieve the highest performance possible. Sound technicians go through a testing process to, in effect, "tune" the receiver\\'s sound. Designed to the details. The interior of the unit has been precisely planned, circuit-routed and built so that the left and right channels are physically and electrically isolated. This naturally maximizes channel separation but also greatly improves signal to noise ratio and also helps to achieve a wide open sound stage for a superior receiver. Reinforced for rigidity. The interior of the receiver is reinforced with cross members in an H shape to provide an extremely rigid and stable frame. This reduces chassis vibration to virtually zero even during high volume output (seemingly minor vibrations can affect the sound), maintaining the highest audio quality. Balanced audio. The receiver comes equipped with XLR balanced audio input/output terminals. In combination with a Blu-ray Disc™ player such as our BD-A1060, or CD player such as our CD-S3000 / S2100 equipped with balanced output terminals, this enables high-quality signal transmission with reduced degradation of sound quality due to external noise. The balanced input terminals feature gold-plated connections produced by Neutrik, a company with a long history of experience working with Yamaha mixing consoles. State of the art. Our flagship model features ESS\\'s state of the art 32-bit SABRE DACs. ESS\\'s patented 32-bit Hyper Stream, Total Harmonic Distortion (THD) compensation function works to minimize noise levels. In combination with the Yamaha original D.O.P.G. (DAC On Pure Ground) concept, which eliminates the potential difference between audio circuit stages to reduce ground noise, it dramatically enhances silence and resolution over the entire audio range for rich and expressive reproduction of even the most delicate sounds. Intelligent Surround. This AI technology built into the DSP analyzes the scene of your entertainment content and creates an optimal surround effect to reproduce it with the greatest effect. In real time, this AI instantaneously analyzes scenes by focusing on distinct sound elements such as dialogue, background music, ambient sounds and sound effects, and automatically optimizes the surround effect. The effect is a compelling sense of realism beyond conventional sound field effects, giving you the best of every scene in an entertainment experience. With three HDMI output terminals, you can simultaneously connection to the TV, LCD projector and other devices to watch two separate video sources at the same time. Or broadcast the same video source like a ball game across all outputs. Compatibility with these amazing sound technologies creates an extraordinary experience. They deliver breathtakingly rich and realistic surround sound, positioning and moving individual sounds to any virtual point in your room, including objects moving overhead. The revamped CINEMA DSP HD3 features new signal processing algorithms and three sets of high performance processors. Experience the overwhelming realistic movement and immersion in videos — right in your home. * Wireless surround function available via firmware update, late September 2018. YPAO - R.S.C. analyzes the room acoustics with the included YPAO microphone to tune your system for the best sound in your unique room. It employs R.S.C. (Reflected Sound Control) to correct early reflections for studio-quality surround sound. YPAO 3D provides automatic sound parameter optimization that maximizes the 3D sound field effectiveness of CINEMA DSP HD3 as well as Dolby Atmos and DTS:X. 64-bit precision EQ calculation achieves the most natural room acoustics possible. Additionally, DSP Effect Normalization adjusts the room acoustics according to the reflected sounds of each CINEMA DSP program.